Did other countries just want to use the letters America didn't use a lot? Cause wtf. @blind, less that and more that other countries have their own alphabets that don't translate all that well into English, so you end up getting words that look like garbled nonsense to anyone who doesn't speak the language. Also, America didn't invent English. 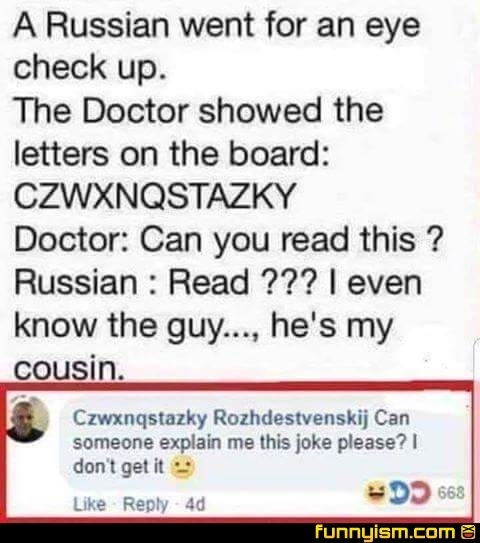 Does this make more sense in Russian or do his parents hate him? @Dephenistrator, look up Polish and Slavic names. @Dr Angel, I will name him Greg. @eleven, I believe it would be "gregorsh Bshen-chih-shih-chih-chih-ki-ev-ich"
@I can spell, believe this guy he can spell!